While the cold air continues to linger over New York, one of the first signs of summer presented itself in the form of an e-mail this afternoon. 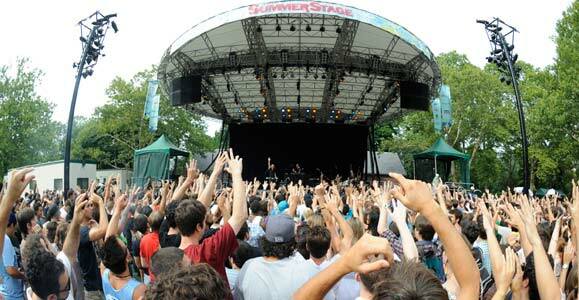 The 2013 Summerstage calendar has been released. Summerstage, a product of the NYC City Parks Foundation, is a uniquely New York. From June 4 – August 29, Summerstage provides over 100 free music, dance, film, comedy, family and theater programs in 17 parks across all five boroughs of NYC. It is an ubiquitous city-wide arts fest and all are invited. The schedule, like in year’s past, is packed with several savory events, including a few premier cost events – like the ones I will discuss in today’s post. While I urge you to check out the Schedule when you have an opportunity, I am going to preview three events I am most excited about, all occurring at the 69th St. & 5th Ave, Central Park location. No, this famous song of sincere contentment was not created by Bob Marley. The song was released seven years after Marley’s death, and, last time I checked, Marley is not 2Pac. “Don’t Worry Be Happy” is the wise advice of Bobby McFerrin, and, in some form of twisted irony, this simple ditty of humorous happiness that is clearly his most known work suffers from authorship mistakes and does not do McFerrin justice. McFerrin is a tremendously talented musicians with a perspicacious musicality that shines through everything he creates. Although I am still trying to figure out the “Don’t Worry Be Happy” video that truly marks the song as one of the weirdest pieces to ever hit the top spot on the charts, I’m sure McFerrin will put on a very “happy” show in August. Wow. This is an eclectic mix of old/new musicians. The Zombies released Odessey and Oracle in 1968, and those who have listened to it can attest to it being one of the better rock albums of the 1960s. The band combined pop/rock with prog/psych to establish an intriguing blend of 60s genres. I saw them at a previous Hippiefest, and they were quite good. Django Django released their self-titled debut in 2012, and it’s combination of electronic rock and indie influences is upbeat and poppy with Franz Ferdinand influences. Heck, there is even some embedded 60s pop in the music. Take a listen to “Hail Bop” below. Enjoy the odd video. Of what I know about the other two performers, Adam Green and Binki Shapiro are folk/pop artists with a pull towards the 60s and DJ Modest P is a skilled New York spinner known for his long time Saturday night residency at the legendary East Village club Nublu. I’m interested to hear what kind of show this will be. I have had an itch to see the Airborne Toxic Event for quite a while. The Californian Indie Rock band – with a name alluding to my favorite Don DeLillo novel – saw well-deserved success with the release of their sophomore album, All At Once, and, by the time this concert rolls around, will be supporting their third release, Such Hot Blood, set for release in late April. Quite simply, this will be an awesome show. Perfect band for the Summerstage.